Much anticipated events can have an edge to them. As much as you hope things turn out well, there's always the risk of disappointment or let down. 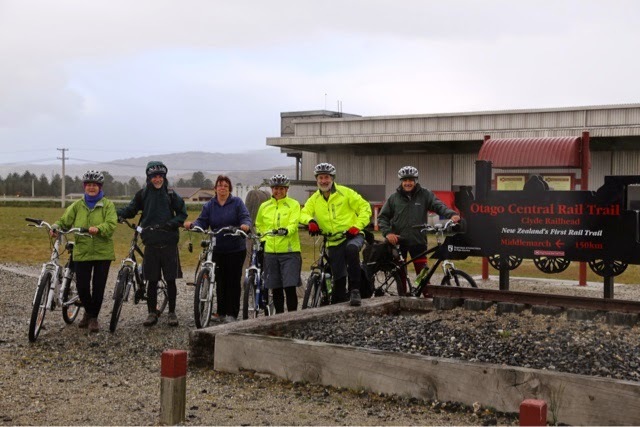 We first heard about the Otago Central Rail Trail about 8 years ago while we were based in Dunedin. Some Tassie friends were visiting, and we'd borrowed bikes and arm-twisted them into catching the Taeri Gorge train up to Middlemarch with us. 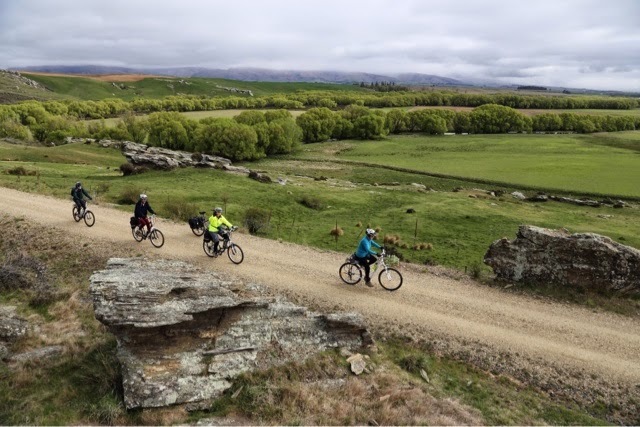 The woman at the iSite in Dunedin had assured us we'd be able to ride a section of the trail from Middlemarch to Pukerangi, then catch the train back to Dunedin, bikes on board. The beauty of a rail trail - we assured our friends - is that it seldom rises or falls by more than 4 degrees, the kind of slope that trains, and wary cyclists, find easy to cope with. But on our arrival, the man on the platform at Middlemarch quickly informed us that the rail trail ran in the exact opposite direction from our intended ride. He then looked at his watch and suggested that if we wanted to catch the train back from Pukerangi, we'd better start riding now. Here he paused, pointed to the hills, and said "up that way", with some emphasis on the "up". 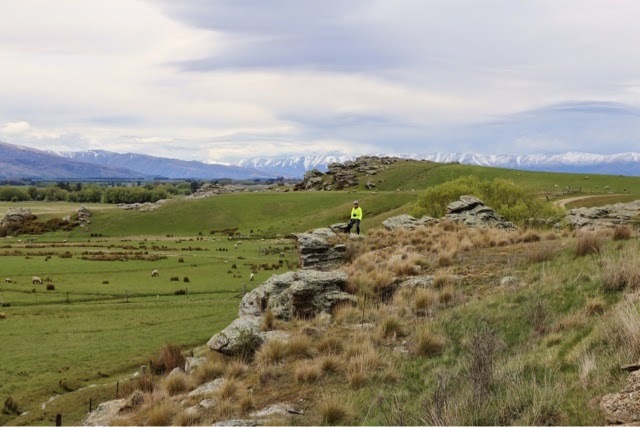 We survived that false start on the Otago Central Rail Trail (OCRT) - with some sweat and tears - though it turned the trail into unfinished business for us. And it provided us with another good reason to return to the South Island, if any was required. And so to October 2014. This time it would be a family trip, with my sister and her husband, and my brother and his wife joining us for the full, proper OCRT. 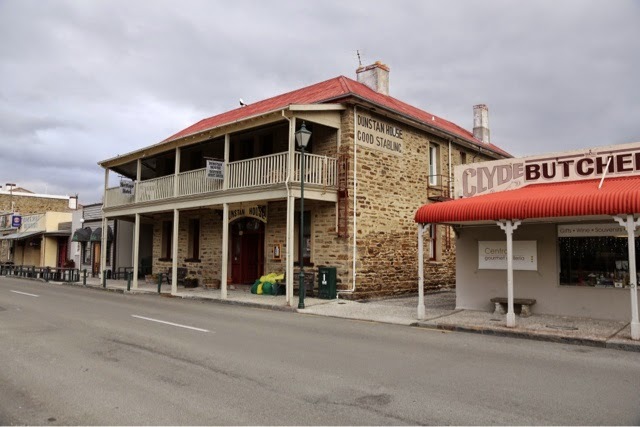 The starting point for us would be Clyde, once the mining town of Dunstan, then the dam construction town of Clyde, and now as much sustained by the rail trail as any other enterprise. Clyde, as with everywhere in "Central", provided us with great hospitality: comfortable accommodation and hearty local food, with a few good stories thrown in. It seems we were staying in a place that once had a secret hidey-hole in its cellar. Colourfully-clad "dancing girls" hid there from police during the wild-west gold mining days. As we readied ourselves for our first day of riding, pulling on fluoro-coloured gear that would have done the dancing girls proud, only the weather gave us any pause for thought. Overnight a gale had hit the area, blowing limbs from trees, shaking our accommodation, and dropping some heavy showers. Although the wind had now dropped, showers persisted as we tried out the hired bikes. My sister had earlier made the decision not to ride as she'd fallen and broken her wrist six weeks prior. Instead she'd hired a car and designated herself as support crew, planning to meet us at regular intervals. For the first day my sister-in-law would join her in the car, partly to share the driving if the bandaged wrist caused trouble. 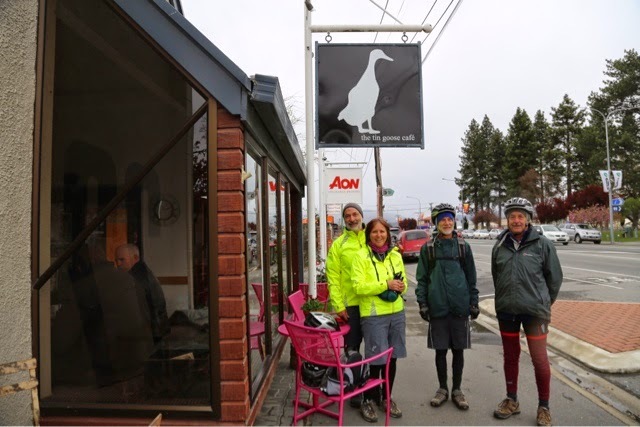 So four of us set off from Clyde, easing ourselves into the riding by agreeing to meet the others in Alexandra for morning coffee, a distance of just 8km. Why not start as you mean to continue? After coffee we left the girls in Alexandra, agreeing to meet for lunch at the Chatto Creek pub. Re-fuelled or not, we still had 27km more to ride today. By Galloway, a remote former railway station near a back road, the coffee had prompted other urges. I stopped by the trail to relieve myself, but before I could finish the job, a car appeared on the nearby road. It was my sister and sister-in-law, laughing and waving a camera at me out of the window. Such a helpful support crew! Another dubious support was my bike computer. It would be my friend/enemy over the coming days, Spock-like in its insistence that factors such as headwind or uphill slope would each knock X or Y km/h off my speed. We had both of these on our after-lunch climb of Tiger Hill. One minute I was tootling along at 20km/h, the next reduced by wind and hill to 8 or 9 km/h. But what goes up must come down, and after the steep(ish) winding hill we had some faster free-wheeling sections on the way into our overnight stop at Omakau. 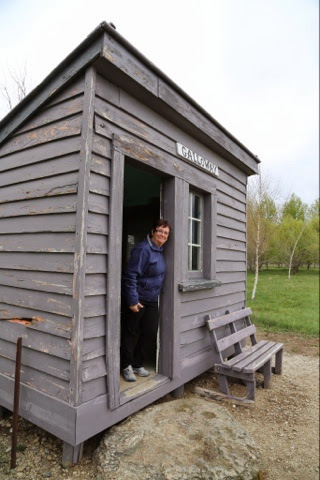 My sister even managed to redeem herself by waving us off the trail into the town and showing us where we'd be staying. So that was Day 1 done. 35km, windy, showery, and somewhat uphill; cobwebs well and truly blown away.